Alex LaDuca travels to Miami to continue her investigations into the murder-and-money laundering activities of the Dosi cartel, an intrigue set in motion in Hostage in Havana. Sent there by the U.S. Treasury Department to speak with a recent Cuban defector, she soon realizes this key player may be no help at all. A vast global money laundering scheme fueled by cocaine profits. A man who promises to put Alex 'in touch with the deceased.' A lethal trap by the Dosi cartel. A handsome actor back in New York who suggests that love and romance may soon return to Alex's life ... Alex attempts to navigate a Miami underworld that encompasses elements of the surreal and supernatural. But can Alex emerge from this world with her life---and her faith---intact? Can she get past the painful tragedy of her past and discover God's plan for her future? Readers of general market thrillers, such as Robert Ludlum and Tom Clancy will eagerly anticipate this second installment. About "Murder in Miami (#02 in The Cuban Trilogy Series)"
Noel Hynd lives in Culver City, CA. He has over four million books in print throughout the world and is the bestselling author of the highly acclaimed novels The Enemy Within, Flowers from Berlin, Ghosts, Conspiracy in Kiev and Midnight in Madrid. In the second book in The Cuban Trilogy by bestselling author Noel Hynd, U.S. Treasury Agent Alex LaDuca travels to Miami to continue her investigations into the murder-and-money laundering intrigue set in motion in Hostage in Havana. 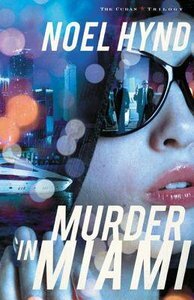 Caught between the Dosi cartel and cocaine profits, and the surreal and the supernatural ... there's Murder in Miami.